Come home to a four-legged friend that's always ready to play. 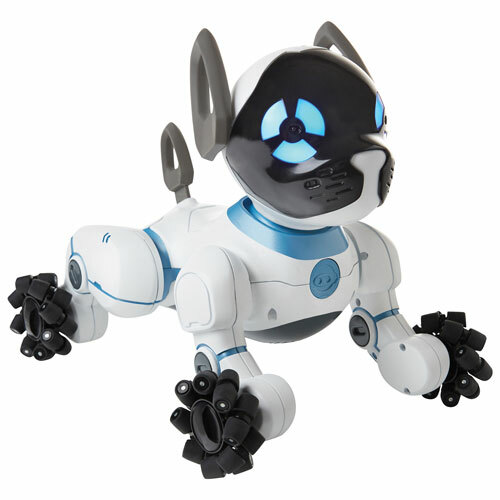 CHiP the robot pup is an intelligent and affectionate companion that responds to your behavior using advanced sensors and smart accessories. Thanks to the included smartband and smartball, CHiP can does things like follow you and play catch. It's also trainable using voice commands. CHIP's advanced sensors enable him to act with intent and move/look towards his ball, owner etc. l might be getting one soon, (HIGH CHANCE) and from all the YouTube and reviews, it looks great! Must get! Love the bot, the app and voice control. Even like the 'follow me' feature. If you are thinking about getting this for your kid, you should. such a shame, my nephew loved this toy but just after christmas there was a strong burning smell and it stopped working, returned and exchanged for another and the bluetooth watch wasn't working or charging as well as the dog itself stopped lighting up. probably one of the coolest toys out there at the moment, just a shame that got two lemons in a row. Wasn't willing to give it a third shot. My nephew still asks about this. Poor guy. This is an excellent product and our grandson loves it!! It does more than we thought and is well worth the price. Would definitely recommend it to anyone. We just got this little guy and he is so cute and a lot of fun! He does the most adorable dances. My little girl loves throwing the ball for him to fetch. It's cool that you can download the app and be able to feed him and also see what he has to say. You can also control him from the app by making him move, he is so fast its kind of crazy!! Glad we bought this toy for our daughter, she will be able to train it and play with it for a long time!